This is our latest booth! Seems like we've been doing so many shows this year. My girls have been covering the hours at the show for the last three days. I'm so thankful for their work! I thought I was going to have to be there, but my wonderful daughters let old mom off the hook. I've been trying to get my fall stuff down, house cleaned and Christmas up! The booth was mostly mid century and vintage goodies. Lots of stuff but fun stuff! The most important people in my life-my family! Had a nice turkey dinner at Alisa and Marcos' home Thursday afternoon. Everything was so yummy and the family got to meet Eric. I'll be posting those pix on Facebook. After dinner Jim and I joined Eric and Gina at Angie and John's. It was so fun! They had a champagne toast for Eric and Gina. We look like the happy "retired" mom and dad! It's going to be so nice to have both daughters married and settled. Jimmy likes to tease-off the payroll! Gina, Angie and Jimmy...goofing around and having lots of fun together! We enjoyed the kid's friends who stopped by and their Texas company. Robbie...did you get enough chips? Wish his mom and dad could see this picture of his sister with him. Poor thing, she was so cold here! Happy Thanksgiving to all my blogger friends, Tasha friends, Teacup Thursday friends and everyone else. My girls and I set up for a Christmas show yesterday and the girls will man most of the hours over the next two weekends. We're off to have dinner with my family at my sister's home. My future son in law is driving down from Seattle as I write to meet the family. I'm sure he will be glad when this is behind him and he can just relax with the family! I'm excited to see him again too. I'll post pix of the show booth and the dinner later. I'm taking a break from most of computer for a bit. I feel so thankful for the many blessings God has showered on me and my family this year. Blessings to all as we celebrate today and begin the Christmas season. A very funny vintage postcard to share...this is for my vegetarian niece Amanda! I'm sitting in my cozy little home with my woodstove chugging away. It was such a wet and stormy day...a taste of what's to come. Jim is in Illinois again so I'm home alone for a week. I've been working on paperwork, letter writing, reading and posting more Etsy things. I cannot believe how quickly the days slip away, especially with the time change. I've also been trying to get back on my healthy eating cutting the sugar and carbs for awhile. Oh, all I could think of today was a pumpkin scone! This is a photo of a beautiful Spode plate that I found earlier this spring. Those of you who know me, know that I just love brown, so this was a special find. I love dishes with interesting boarders. So here we are again...time for Miss Spenser's Teacup Thursday! How can the weeks just fly by??? This is my very favorite pattern for Thanksgiving-Wild Turkey by Johnson Brothers. I have the dinner dishes for this pattern too. We'll be going to my sister's for the big dinner, so I won't be setting a big table this year. I mix and match some of this pattern- His Majesty-with the Wild Turkey. I'll save some other I use to share with everyone next year. This makes for a nice dessert and coffee set...pumpkin pie or apple pie? I do like pecan pie too. Saddly, I like them all. It's almost time to take down the fall decorations and I realized I didn't post my pumpkin house. I made this a few years ago with LaVonne's encouragement. We found the little crows at a thrift store on her first visit to see me on her first trip out from Montana. She told me how to make the house and walked me through it, as so often does when it comes to our crafting! It was so fun, I'd love to make another one someday. The little bunny that I received in my Tasha Tudor Fall exchange just fit right in with my pumpkin house. She is right at home. 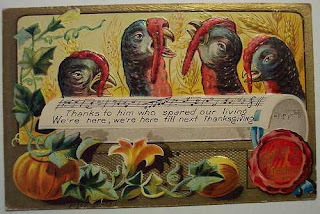 I'm looking forward to Thanksgiving. It's such a nice holiday to be enjoyed. So many blessings this year. Sweet Sarah Moog and Her Yummi-bears! I was at a flea market on Sunday and I met the most delightful sweet young woman, holding a darling little girl in her arms. 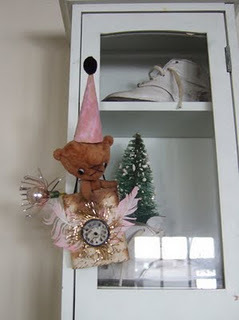 Sarah is an artist who creates the most adorable tiny bears and a few other critters. She should be showing her items off in a gallery! I added her blog to my blog list on the right, and you will be in awe if you visit her blog. I was reading along and that wee babe in her arms came early, so I'm sure this young mom is super busy with two children now. She also told me here husband has been building her a studio out of reclaimed items and things found on Craig's list. Don't you love stories like that! Sarah....I think one of your bears should be living in a tea cup! Best of wishes Sarah. Keep your dream alive. Last weekend Columbia River Gorge Retreats hosted our 6th quilting retreat. This was our second one at our new home at the Best Western in Washougal WA. After a rocky start and help from the manager Chris, we finally got things set up and rolling. I think I posted earlier that I was working on the pampering gifts, but I couldn't post the pix as I didn't want to spoil the surprise. This was our UFO retreat...unfinished projects and we had a fun alien, robot, space theme. We always make a pincushion for our guests. Peggy made the flying saucers this time. Here's the other pampering gifts for you to see! These were so much fun this time...fun to be a kid! We had to set up the room late Thursday night to greet our quilters in the morning as we had a bit of a problem when we arrived. It was fun to have the ladies come in the next morning and find all the decorations. The snack bar was all dressed up for the UFO pampered quilter's retreat! Ready for a good time ladies. A purple alien and a blue alien guarded each door to the conference room. I posted pictures on our FB page...Columbia River Gorge Retreats to share, so pop on over for some more fun pictures. I'll just post some random photos here so you can see the quilters at work! Here's the mug shot of Peggy and me! You can see everyone else if you check out our FB page. Today is Veteran's Day in the USA....a day off for many folks. I was watching a program on public broadcasting last night on the Viet Nam war and it brought back so many memories that have been tucked away. I don't come from a military family. My dad was too young for WWII and having two small children during the Korean war, he wasn't called to duty. My only brother was in college during the Viet Nam conflict, so he was never drafted. That was a difficult time for our country and it really took me years to respect the military. I have four nephews from Jim's brother Allyn's family that have been in the service, two over in Iraq over the years, and one is still in the Navy. I was in tears last night watching the program, listening to men and women my age telling their horrible stories. 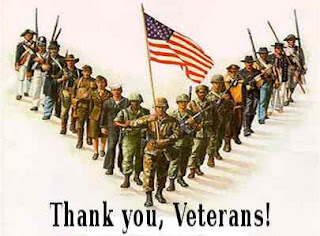 I guess I just want to say thank you to all who have served this mighty country. I never favor war as a solution, but it seems to happen. I'm sure our many veterans would have rather been safe at home...I had that luxury. Thank you to all. A few weeks ago I won a delightful free embroidery Pattern from Fay at Simply. She has posted a great Thanksgiving pattern to download that is darling, so I'm sharing it here with you. Thanks Fay...love your work! I had to miss Miss Spenser's Teacup Thursday last week and I didn't even have time to post anything before I left for my quilt retreat. It was a week ago and I'm still trying to get back to normal. My clients had a great time and we have bookings for next November, but it was a difficult event. Lots to work out with my business partner. Moving on now....it's still fall and the weather is turning colder. Jim brought more wood up and chopped up lots of kindling for me. Snow tires are on the cars, storm windows are on and I guess we are almost ready for winter. A few more things to do in the yard to shut it all down. I ADORE acorns and acorn decor! I saved this acorn cup and saucer for today as it is one of my favorites. It's Austrian and very delicate. Jim bought this acorn needle keep for me this summer in Port Townsend. It's called vegetable ivory and is actually carved from nuts the same way that ivory was carved. Very Victorian. I found a thimble made of the same material that I didn't know I had. It's just such an interesting medium. Sweet little thing with it's crocheted holder. I've gathered a few other acorn treasures over the years. We don't have any oak trees, just maples, so friends have given me acorns. When I returned home Sunday night from the retreat, I had a package waiting for me from my Tasha friend Suzanne in MA. It sure came at the right time and cheered me up. Her card and personal note were so kind...thanks again Suzanne! I love my treats and our friendship. What a great little box of magnets...all with a cute little laundry theme and brown! 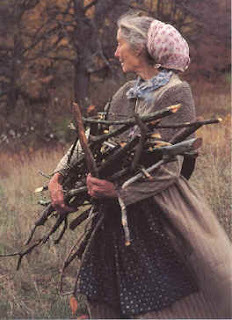 This is the card Suzanne sent to me...it's one of my favorite photos of Tasha Tudor.